Mother’s Day is just around the corner! 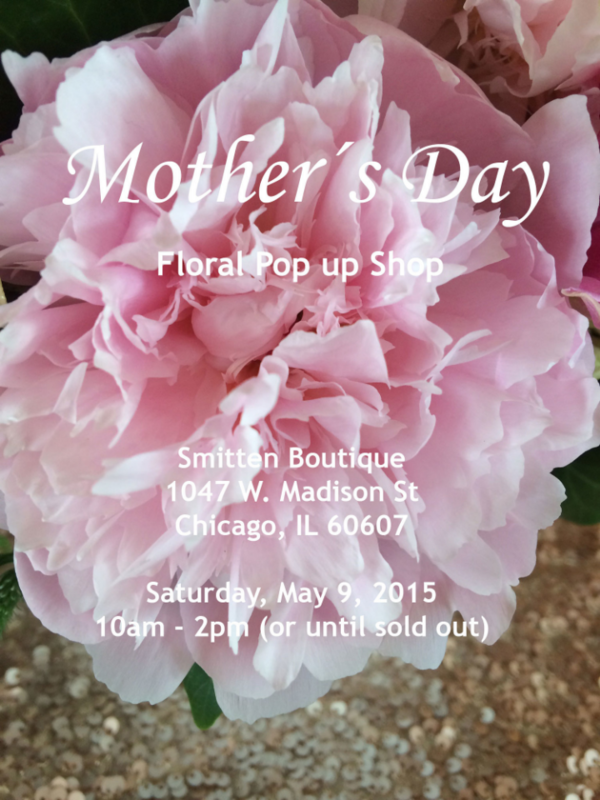 The wonderful ladies over at Smitten Boutique and I have partnered and planned a fun Mother’s Day Pop Up Shop this Saturday, May 9th, 2015 from 10am – 4pm. I will be there 10am – 2pm (unless I sell all of my stock early) and will be selling some beautiful one of a kind hand-tied bouquets with the option of purchasing a vase and the ladies at Smitten are going to have paper goods so the kiddos can make a special card for mom. They’ll also have the option to make a cute bracelet as well which is such a cute way to tell mom how special she is. I will be selling two different size bouquets: the small bouquet will be $35 and the large bouquet will be $50 with the option of adding on a vase for an additional $5. All of the arrangements will be crafted and designed by yours truly. It is going to be a great Saturday so stop on by and get the mother in your life something special. I will be accepting cash, check and credit card that day. You can also, if you prefer, order ahead of time by emailing me at kristina@visionofeleganceevents.com or by calling me at (248) 982-3757. Quantities are limited so make sure you get there early. So excited to meet and see all of your lovely faces this Saturday! And Dads, make sure you bring the kiddos! It’s going to be a great place for you and the kids to get mom something special. Oh, I almost forgot: with the purchase of something from our pop up shop, Cone (the ice cream shop next door to Smitten Boutique) will be offering a FREE Kiddie Cone with the purchase of a regular menu item. YUM!! Flowers, cards, bracelets and ice cream for the kids and dad! Sign me up! Look forward to seeing you Saturday!